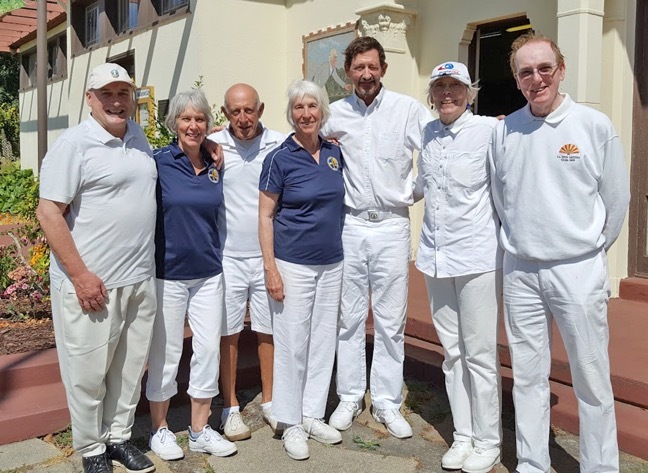 This past week end at San Francisco Lawn Bowling Club, six women’s pairs teams battled for the right to represent the PIMD at the National Championships in September. They played three 18 end games on Saturday and two 18 end games on Sunday. 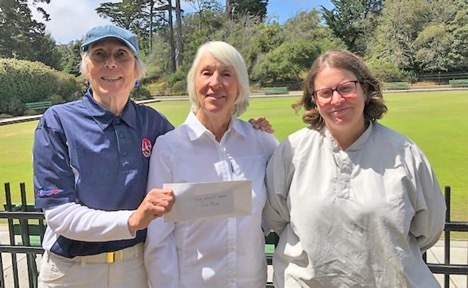 Despite the freezing cold wind on Saturday, BLBC’s own Cathy Dinnean and Sarah Allday won two games and lost their third game by only one point. They were tied on the 16th end in games one and two and went on to win. They were tied in the 17th end of their third game; Cathy missed making the winning shot by a hair. All three games were exciting to watch. (Two teams didn’t finish until 7:30; they played their last end in the dark. Happily, we three ladies arrived at our club about then.) Cathy and Sarah weren’t as successful on Sunday. Despite some fine bowling by both ladies, they lost both games by six points. However, they ended up in third place. Not too shabby for their first time at the play-downs! The winning team: Angie Peet and Rose Selby–the only team to win all their games. Team Ginger Harris and Janice Bell (also a BLBC dual member) are the first alternates. Eleven men’s pairs teams also played. The top six teams will compete again next weekend. Sadly, BLBC team Jim Corr and Bob Schwartz just missed the cut. However, BLBC dual members Daniel Gorelick, Mo Shooer, Frankie Napoli and Russ Leonard advanced. Good luck going forward, guys! The weekend of July 14-15 saw the annual Singles Championship Tournaments for both men and women in the Pacific Inter-Mountain Division (PIMD) and Berkeley bowlers stood out in each of the events. First up was the women’s event, a one-day competition on Saturday involving three matches in gusty wind conditions. Three Berkeley bowlers entered—and swept the board, taking 1st (Cathy Dinnean), 2nd (Ann Brillhart), and 3rd (Giulia Gallo) place. The men’s tournament ran over two days, with three of Berkeley’s six entrants making it to the knockout round on Sunday—Cris Benton, Jim Corr, and Rob Hoey. 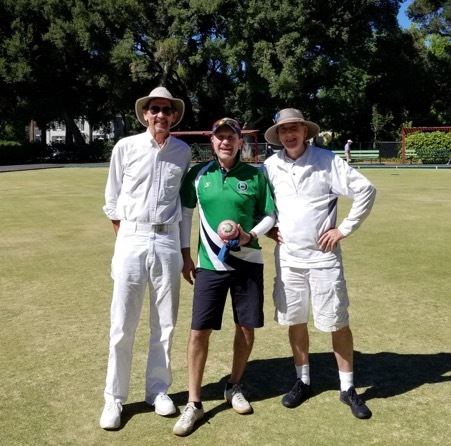 Unfortunately, the luck of the draw meant they ended up playing each other, so they couldn’t quite emulate the women’s feat, but Jim Corr took 3rd equal place and Rob Hoey came out on top, beating Larry Collaco of Sunnyvale in a nail-biting final. 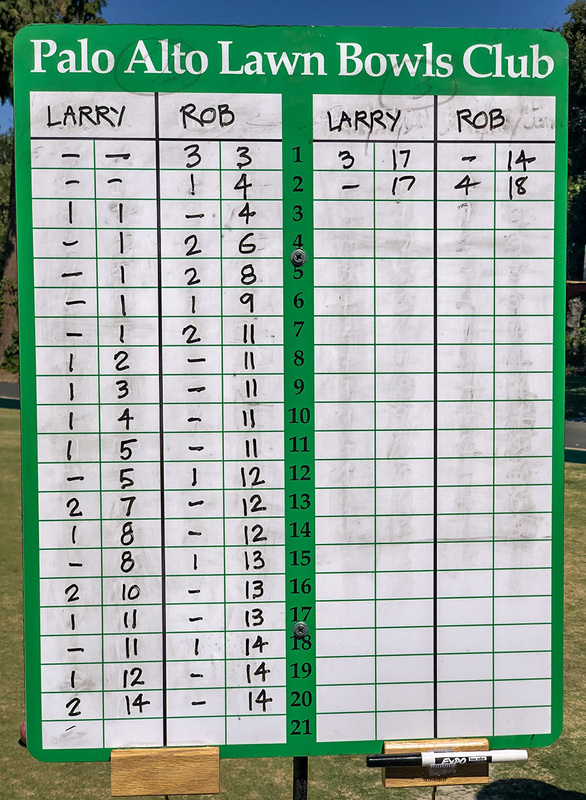 Rob initially ran up an early substantial lead (11-1) but Larry would not have it and steadily chipped away in small increments, to pull ahead to 17-14, with 18 points being the ultimate goal. But in a stellar final end, Rob put in four shots within a couple of feet of the jack and took the honors by the narrowest of margins, 18-17. Berkeley bowlers in Day 2 of 2018 PIMD Men’s Singles Tournament: (l-r) Cris Benton, Rob Hoey (Ist Place), and Jim Corr (3rd= Place). Today the annual Men’s and Women’s Memorial Pairs Tournament was held at the Oakland club. During a beautiful day on the green, six teams of men, and six teams of women played three 12-end games. Bud Birkenseer was his usual entertaining self as Director, and the Oakland club laid out a selection of enticing snacks. and our newest member, Ian Cameron, won one of the three raffle prizes. Our thanks to the Oakland LBC for hosting a very enjoyable tournament. Our Berkeley bowlers shining at the PIMD Memorial Pairs tournament. Left to Right: Ian Cameron, Leslie Engler, Ethan Bortman, Cathy Dinnean, Cris Benton, Annie Brillhart, Jim Corr.